From hitting, to pitching, to a virtual reality home run derby, the MLB All-Star FanFest brings a highly interactive baseball experience to Washington. 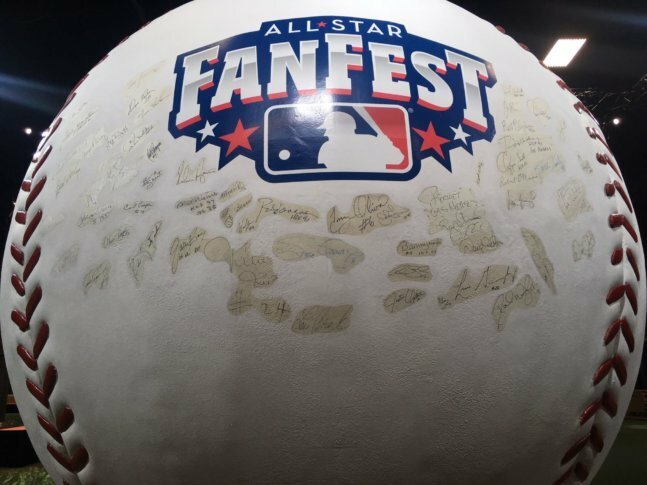 WASHINGTON — The most pleasantly surprising aspect of this year’s MLB All-Star FanFest, which opens at the Walter E. Washington Convention Center on Friday, is the baseball itself. Unlike many exhibitions, it is chock-full of interactive hitting, fielding, pitching and base-running experiences in every corner of its 400,000 square feet. Want to test out your rocket of an arm? There’s a speed pitch setup for both baseball and softball. Want more information on your swing dynamics? There’s both a Trackman setup to provide Statcast numbers just like the pros, as well as bats with censors on the knobs at FanFest Batting Practice to provide the kind of data most players never get to see. You can test your base-stealing speed against simulations of some of the fastest players in the game. You can even work on fielding at one of several diamonds set up throughout the space. But let’s be honest — you’re here to sock some dingers. Perhaps the most compelling interactive experience is the Home Run Derby VR, a virtual reality game set inside Nationals Park. Fans throw on the headset and find themselves at home plate, facing a pitcher, where they get 90 seconds to hit as many home runs as they can. But there are actual stakes to this game. The game tracks scores for each user, and the top 32 players from Friday, Saturday and Sunday will qualify for an actual bracket-style home run derby on Monday at FanFest from 2 to 5 p.m., which will be streamed live on Twitch, YouTube and Facebook. The winner will take home a trophy and a huge prize package, including four tickets to Tuesday night’s MLB All-Star Game. But even for those who don’t want to swing for the fences, there are plenty of experiences. The National Baseball Hall of Fame has an exhibit that includes a collection of the history of baseball in D.C. There are trophies on display, including the World Series Trophy. And even if you’re not a Nats fan, there is a column for every team displaying one of their All-Stars, complete with a looping video of team highlights. There are also augmented-reality extensions on posters of Max Scherzer and Bryce Harper right at the entrance (as well as other players throughout the floor), which play videos through an app on your phone. FanFest opens to the public Friday and runs from 9 a.m. to 8 p.m. every day through Tuesday, when it closes an hour early, as the All-Star Game begins at 8 p.m. that evening. To access FanFest, enter the convention center from doors on the south side of L Street Northwest, then proceed down to the concourse level to get registered. While you can purchase tickets and register on site, you’ll save time by doing so online in advance, where you can also fill out your waiver for participating in the various interactive programs. By signing up for the free FanFest Experience Pass, you can check in to win prizes throughout the exhibition, everything from the first spot in an autograph line, to photo opportunities with mascots, to tickets to the Home Run Derby and All-Star Game themselves. MLB gave out over 2,000 prizes at last year’s FanFest. Tickets are sold on a timed-entry system, so be sure to check your time window. You can arrive any point after your designated time and stay as long as you’d like. There are plenty of ticket specials, including buy-one-get-one-free for Friday’s opening day. For a complete list of discounts and other information, visit Allstargame.com.